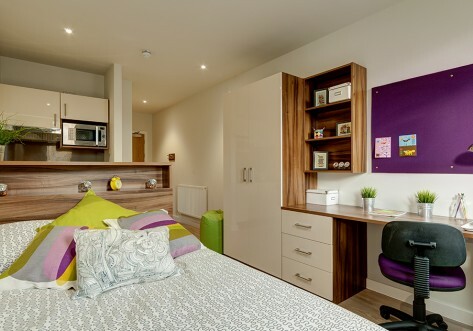 Opened in January 2016, Victoria Hall King’s Cross is the perfect location to live in central London as a student. Located within Zone 1, minutes from King’s Cross International train station and underground station. Victoria Hall King’s Cross offers an exceptional living experience designed by award winning architects. 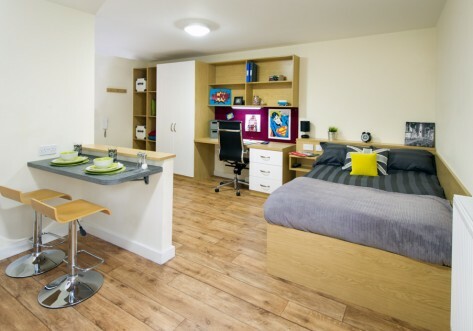 Featuring quality bespoke furniture and fittings in spacious rooms with a generous study area – all rooms have been designed with study in mind! 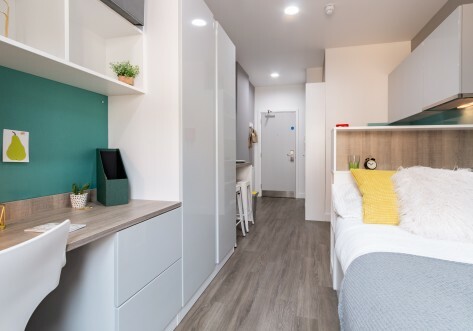 Students can choose from either a one bedroom apartment, a shared flat with living room or a variety of studios suitable for both singles and couples, each with en-suite facilities and ample personal storage space. Community spaces include a reading room, meeting room, 24/7 fitness room, break-out areas and a lounge area with an open kitchen for group social events. 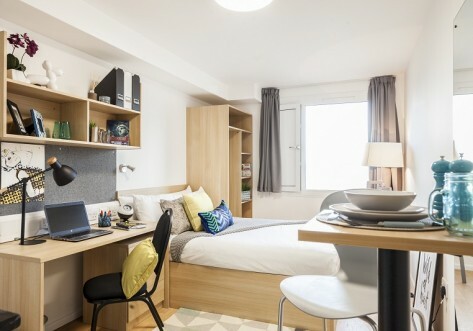 Door entry and intercom systems, supported by CCTV cameras ensure students’ safety, and our friendly management team are here to ensure your stay at Victoria Hall King’s Cross feels like home away from home. ¾ size double bed with ample storage space, built in double wardrobe and full length mirror. Large desk space with chair. Kitchen with fridge/freezer, double hob and combi microwave oven. Extensive kitchen packs provided. Own en-suite bathroom. Variety of sizes, average is 22sqm that are located on floors 1-11. Accessible studios are also available. Double bed with ample storage space, built in double wardrobe and full length mirror. Large desk space with chair. Kitchen with fridge/freezer, double hob and combi microwave oven. Extensive kitchen back provided. Seating area with table and chairs. Own en-suite bathroom. Variety of sizes, average is 32sqm that are located on floors 1,8 & 11. Separate bedroom with double bed and ample storage space, built in double wardrobe and full length mirror. Large desk space with chair. Kitchen with fridge/freezer, double hob and combi microwave oven and living room. Extensive kitchen packs provided. Seating area with table and chairs. Own en-suite bathroom. The one bed apartment is 39sqm and is located on floors 9, 10 & 11. Accessible apartment available.